As we kick off Tsunami Preparedness Week, we pause to remember the 124 Americans who prematurely lost their lives without warning 50 years ago, when a powerful earthquake sent several tsunami waves crashing into coastal towns in Alaska, Oregon and California. On March 27, 1964, a 9.2 magnitude earthquake – the largest recorded earthquake in U.S. history and the second largest in world history – occurred in Alaska’s Prince William Sound. In addition to the lives lost, the tsunamis caused an estimated $1 billion in damage. Since 1964, we’ve been reminded about the power and danger of tsunamis. The devastation and heartbreak of the 2004 Indian Ocean tsunami remains with us a decade later, and images from the Japan tsunami are still fresh in our minds three years later. These events should serve as a reminder that a powerful tsunami can strike anywhere in the world, any time of year, and the U.S. is no exception. Coastal populations and infrastructure have increased significantly over the past 50 years, making the U.S. even more vulnerable to the impacts of a tsunami. However, the nation also has made substantial advancements in earthquake science and the ability to prepare for, detect, forecast, and warn about tsunamis. While we cannot stop a tsunami from happening, we can minimize loss of life and property through preparation. Today, NOAA leads the U.S. Tsunami Warning System, which includes operating two, 24/7 tsunami warning centers; managing a network of tide gauges and tsunami buoys, and monitoring seismic stations throughout the world’s oceans; administering the TsunamiReady program; and leading the National Tsunami Hazard Mitigation Program, a state-federal partnership that works together to prepare America for a tsunami. Effective preparedness depends on accurate hazard assessments. In recent years, NOAA and its state partners have made significant progress in modeling and mapping the tsunami hazard along U.S. coastlines, which has enhanced the nation’s ability to forecast and provide warnings for tsunamis. 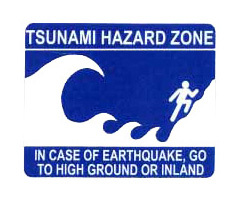 One key aspect of a hazard assessment is the accurate prediction of where coasts will flood during a tsunami. NOAA builds and updates high-resolution coastal digital elevation models, which depict Earth’s solid surface to further the understanding of ocean processes, like tsunamis, and inform decision-making. The models are incorporated into tsunami models, which simulate tsunami movement across the ocean and the magnitude and location of coastal flooding caused when the tsunami reaches the shore. The results of these simulations enable tsunami warning centers to issue more accurate forecasts, as well as support state-level evacuation mapping, preparedness and mitigation planning.